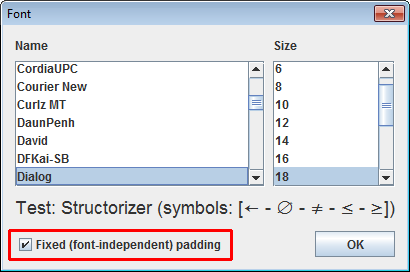 On the dialog shown in the following screenshot you can change the font that is used to draw your diagrams. You need to choose a font that supports Unicode. 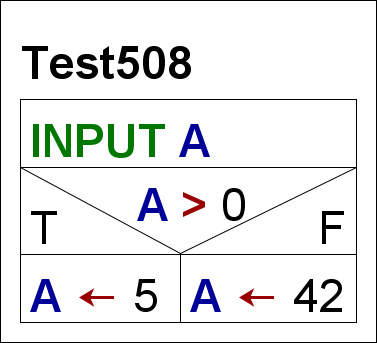 Check the test string in the font dialog and make sure you see an arrow (←), the symbol for an empty set (∅), and the compound comparison operator symbols (≠, ≤, ≥) between the brackets. If you just want to size up or down the current font then you might use the toolbar speedbuttons or key combinations <Ctrl><Numpad+> / <Ctrl><Numpad-> instead. Since version 3.28-01 you may alternatively use the mouse wheel with <Ctrl> key pressed (zoom function). Note: The font chosen here is only used for drawing the diagrams. It is not subject to the GUI Scaling preference. Both are completely independent. At the same occasion the line spacing was somewhat reduced, which particularly affects multi-line instruction elements.